Be my FbF (Friend beyond Faith)? © AFS Vivre Sans Frontiere, William Deperrois / Incorp Agency Greet with AFS Vivre Sans Frontiere! AFS is a big and beautiful family, stretching around the globe and encompassing an incredible variety of backgrounds, cultures and religions. I usually am not one to speak out publicly on potentially charged topics, but as the Muslims in the AFS community have been having a hard time in the world outside our AFS cocoon, I feel that some TLC [tender loving care] is overdue, and Ramadan seems to be the perfect time (for those who want to know more info on Ramadan: there is an excellent blog entry on this in the ICL blog). 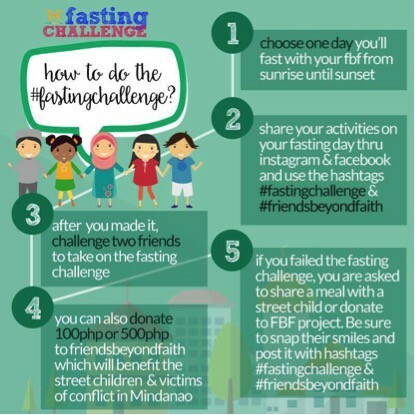 On June 28, 2015, I completed Friends beyond Faith’s fasting challenge. Friends beyond Faith is a campaign to propagate the beauty of culture by highlighting positive interfaith friendships among the youth all over the world. The campaign started in the Philippines and was picked up by the national director of AFS Philippines, who then challenged some of her colleagues and friends, including me. One day of fasting was an interesting intercultural experience for me, and it reconfirmed the notions that I would associate with Ramadan before. To me, as a non-Muslim, Ramadan is about family, about appreciating what you have and about giving back. Family, because it is a unique month in the year that brings you closer together. Being appreciative, because by abstaining — not just from food and drink but also from being mean or hurtful towards others — you become more thankful for what you would otherwise always take for granted. Giving back, because charity and feeding the poor are key concepts in Ramadan and the concluding Eid al-Fitr. I would like to ask our Muslim brothers and sisters: What does Ramadan mean to you personally? Please share your personal experience and insights with us below. At the same time I challenge all non-muslims in our beautiful AFS family and beyond to do one day of fasting too! It is only a day in a lifetime but it is a great experience. Ramadan ends on July 17 in many countries so you may need to postpone the fast until another holiday or next year. When you do fast, post about your experience in social media! After all: Why keep all this goodness to yourself when you can create more awareness among those around you as well? AFS is a community of 50+ Partner organizations, supported by 44,000 volunteers worldwide, who provide global exchange and intercultural opportunities.